Yes, I played with color. Experimenting with new palettes is always fun. This combination felt quite pleasing. I like bright colors, but I need to plan a better composition. I've taken design classes, studied theories on composition, but still feel like I haven't mastered effective composition. Right now Composition by Arthur Wesley Dow is in my shopping cart at Amazon. I discovered it while rambling through Katherine Tyrrell's blog, Making a Mark. It is a classic text which apparently influenced Georgia O'Keeffe's paintings extensively. I've examined a number of texts on composition, some better than others. I'll let the book sit in my shopping cart tonight and decide tomorrow whether to hit the purchase button. This painting is 8x10 on a recycled hardboard panel. As I drove home today, I saw Mount Rainier towering above the road, covered with plenty of snow. On a clear day much of Western Washington Stae can view the site of this dormant volcano. Native Washingtonians often say the mountain is out as if it were some type of animal that hides in its den waiting for sunshine. 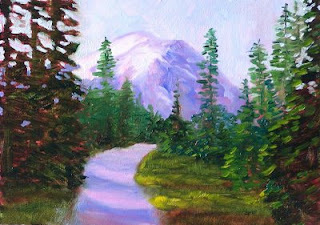 When I arrived home, I was a surprise to find that this paining of Mount Rainier had been selected for the "Purple Mountains" Treasury at Etsy. This original painting is 5x7 inches on a gessoed hardboard panel and can be purchased at my Etsy Gallery for $50.00 plus $6.50 shipping to US addresses if you click here. If you would like to visit the Treasury and see a delightful collection of Purple Mountain handmade items, you can click on this link. Today's painting is from the Different Strokes Bi-Weekly Challenge in which I frequently participate. The interesting challenge with this subject is that of getting the perspective correct. Mastering perspective is a skill I would like to perfect. It combines knowing the correct formulas, executing them, keeping straight lines straight, and curves appropriate. 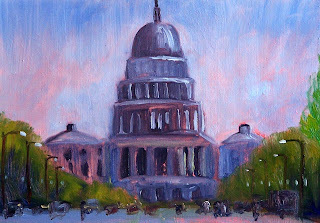 The painting was created in oils on a 5x7 inch mdf panel. Creating this 8x10 inch still life oil painting was fun. Working from life, I tried to avoid fussing over details. Making a stroke and then leaving it alone can be a real challenge for me, but that was my approach with this painting. I was determined not to fuss. In addition, I enjoyed the abstractions the bird's eye perspective. I'm pondering the exploraion of this subject further, perhaps in a larger painting or a series. I still have a 16x20 inch glazing project that I need to finish. Until then I will continue to ponder and practice. 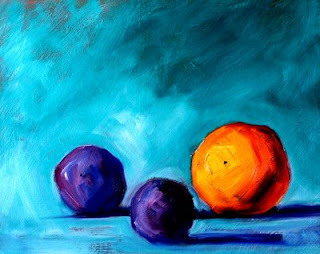 Painting fresh fruits and vegetables is always fun for me because of the bright colors and interesing shapes. Even though the variety of fruits and vegetables decreases in the winter, there is usually a good selection of colorful peppers. This little tray of peppers caught my interest and was very cooperative in sitting for a portrait. 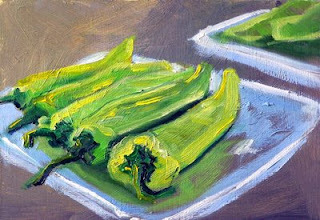 This 5x7 inch painting would be a great addition to a collection of kitchen themed paintings. Framing a group of six or more paintings with identical frames would fill a wall beautifully. Since this painting is a standard size, ready made frames can be purchased at reasonable prices. I use Pictureframes.com whenever possible. Their prices are reasonable, their service is superb, and they offer both ready made and custom framing. 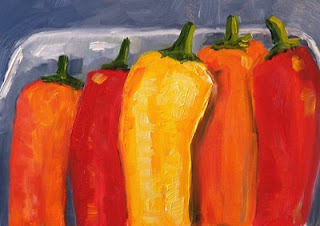 This little pepper painting is for sale in my Etsy Gallery for $50.00 plus $6.50 for shipping to US addresses. You can see closeups and purchase by clicking here. Yesterday I spent several hours at the off-leash dog park. It is definitely an adventure with every kind of dog and every kind of personality. Some love to romp and run while others are shy and hang on the edges. Some lumber and some sprint. Some yelp with delight and others just sniff the air. 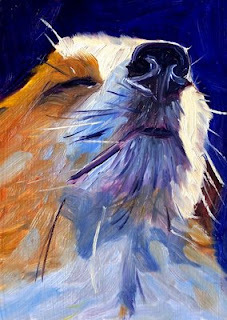 Today's 5x7 inch dog portrait is inspired by the love of sunshine on a K-9 friend. One of the delights of living on the west coast of Washington State is that I can drive from the mountains to the beach in just a few hours. I spent last weekend on the Washington Coast. It was three days of beautiful clear sunshine and walks on the beach. 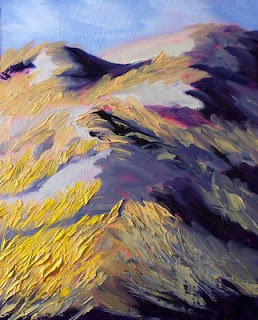 It was the miles of sandy beaches and dune gralss that inspired this 8x10 inch oil painting. Every time I visit the beach, the landscape has changed. Winds, waves, and shifting sand are sculpted in so many surprising ways. Living in Washington State, residents are never far from the mountains. 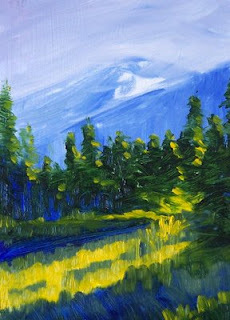 Whether it is the Cascade Range or the Olympic Mountains, we have the pleasure of views such as the one in this 5x7 inch oil painting on a frequent basis. Our mountains are covered with beautiful evergreens that have helped to provide the state with its nickname, The Evergreen State. Sunlight sifting through the evergreens and mist on a distant mountain peak inspired this little landscape. If you have never visited Washington State, consider planning a summer trip to some of our mountainous regions. You'll likely be delighted that you did. Eventually, when this painting dries, I will place it in my Etsy Gallery where I have other small paintings of Washington State mountains. Today's little 5x7 inch oil painting was fun to paint. 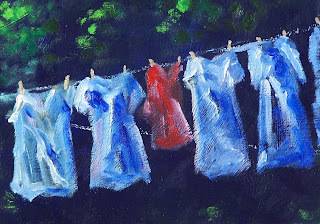 It is created on a recycled hardboard panel, and was inspired by memories of clothes hanging on the line in the backyard of my childhood. I never seen anyone with a clothes line any more. I wonder how much power could be saved if we resorted back to some of the practices of our parents. I'm willing to try the line in summer, but I'm not sure about winter or going without a washing machine. Just a thought. I am very excited to share that I have beeen accepted into the Artists Collective at 1000 Markets, a new juried online venue for exhibiting and selling beautiful fine art items. The 1000 Markets site is only a few months old and the Artists Collective, a special market within the 1000 Markets site, is even newer. The Artists Collective focuses on traditional fine art media such as painting, drawing, and scultpture. I am thrilled to be able to join such a fine collection of artists. If you visit the Artists Collective you can view work of the fabulous artists who exhibit there. The painting above is one of my 18x24 inch original oil paintings that is available for purchase at Impressions Gallery, my personal gallery at The Artists Collective at 1000 Markets. To learn more about this painting and about purchase information, click here. Visit 1000 Markets to see a beautiful new shopping opportunity, the Artists Collective for a wonderful collection of fine art, or Impressions Gallery to view my original oil paintings. Today was a very special day with the inauguration of Barack Obama, the new President of the United States. Although I couldn't be there, it was a pleasure to watch the news and listen to his inspiring inaugural address. In celebration of this event, I have listed this 5x7 inch oil painting in my Etsy Gallery as a reminder of this historic event. This weekend I spent at the coast with three glorious days of sunshine. It was a welcome change after the ugly weather of the past month. Today's little 5x7 inch oil painting is also full of sunshine. It was inspired by the beautiful foliage of several autumn trees on the edge of a lake. The painting is characterized by heavy impasto. Closeups can be found in my Etsy Gallery where this painting is now listed for sale at $50.00 plus $6.50 for shipping to US addresses. This little 5x7 inch oil painting is finally at a point where I like it. I began on one of my black panels. Working wet in wet, I worked a little too long and the paint muddied. I considered whiping it off and starting over, but instead let it dry, planning to cover it up and create something new. When it was dry, I changed my mind and worked on it some more. 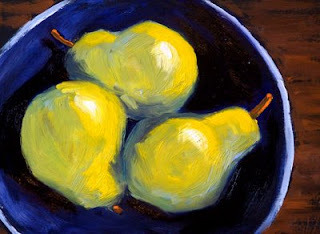 I brightened up the sunlit side of the pears, darkened some of the interior of the bowl, and added the highlights to both the pears and the bowl. Now I'm happy with the painting. When it dries completely, I will list it in my Etsy Shop along with some of my other small fruit paintings. Today's 5x7 inch oil painting has a fun, creepy kind of mood to it. It was created on an mdf hardboard panel prepared with black gesso. I'm beginning to love painting on dark panels. The results are usually quite different from those prepared with white gesso. It has been fun experimenting with these dark panels. Although I don't plan to move exclusively to dark panels, I enjoyed working on them so much that I just prepared another dozen small, dark panels. Who knows what surprises might emerge in the weeks to come? This painting has SOLD. Although I enjoyed painting this 5x7 inch oil painting, I'm glad the recent snow in the Pacific Northwest has disappeared. When the snow first began, I was enchanted by the beauty of the falling snow, but my excitement soon was muffled. The media is now referring to the event as the Month-Long Storm. It began in mid December with over a week of snow, ice, and cold temperature. As the ice and snow began to melt, pouring rains followed, resulting in wide-spread flooding. Interstate 5 was closed, homes were flooded, and roofs leaked and collapsed. It has been a devastating event to inhabitants of the beautiful Pacific Northwest where we are used to mild weather and gentle rains. 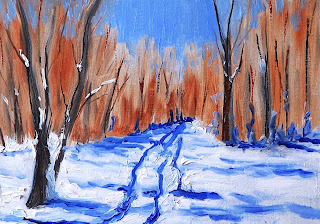 I have listed this painting for sale in my Etsy Gallery and prefer to remember this scene as a reminder of the beautiful first snow of the year and forget about all the nasty events that followed. The painting can be purchased for $50.00 plus $6.50 for shipping. Just click here. 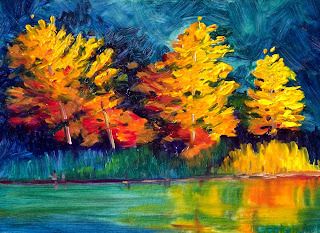 If you would like to see other small landscape oil paintings of trees, mountains, fields, or water reflections please visit my Etsy Gallery. Working on these little twilight paintings has been quite fun. Starting with a dark canvas is helpful. For this painting I used a support made of mdf hardboard covered with black acrylic gesso. It was completed for the Different Strokes Bi-Weekly Challenge. The twilight paintings work very well with a limited palette. This painting was created with a palette of Ultramarine, Alizarin Crimson, Titanium, and Cadmium Yellow. Working with a limited palette also provides a way to keep the painting unified. This painting is 5x7 inches and will eventually be placed in a standard frame, displayed on a small tabletop easel, or when it is dry, listed in my Etsy Gallery along with some of my other small paintings. This little 5x7 inch oil painting is one of my recycle wonders. My receycled wonders are paintings that don't initially turn out to my satisfaction, so I cover the painting with left over paint from my palette. I let the paint dry and eventually paint something new over the top of the old painting. There are wonderful textures and interestingly colored surfaces left from the previous work and paint over. It provides a great freedom. I'm never worried about whether it will turn out or not. These little recycled wonders are spontaneous and delightful. 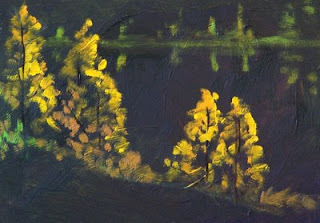 Today's recycle wonder represents some beautiful autumn trees on the edge of a lake at night. The brilliance of the trees is particularly striking in contrast to the darkness of the surroundings. It was a pleasure to create and I'm quite satisfied with the results. Sometimes I think all of my paintings should be created this way. 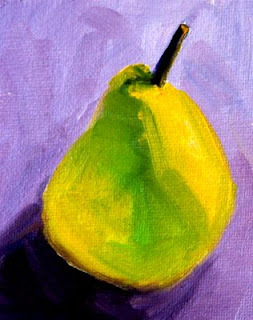 Today I am sharing another little 4x5 inch pear painting. 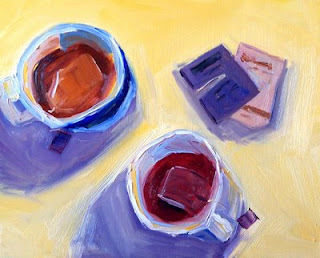 Experimenting with values, colors, light, and shadow is practiced easily on these simple still life subjects. Recently I've been working at limiting my brush strokes, too. I would like to get to the point where I always know before I make a stroke exactly what color, shape, and intensity I will be applying. With discipline, I may eventually arrive at that point. Dabbing away without thinking is as lazy habit I try to avoid. 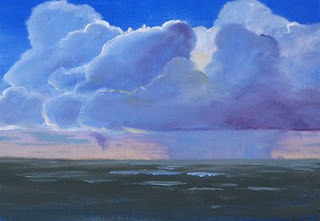 Today's painting was inspired by a view of rain clouds approaching over the Pacific Ocean. As I write this, a storm is blowing in from the Pacific Ocean and pelting the Northwest with rain and wind. Although this painting doesn't depict today's storm, it does provide a typical view of the changing vista of the Pacific Ocean. The painting would be a wonderful little souvenir for a visitor to the coast. Although I've enjoyed this little painting as a reminder of my many visits to the coast, I have decided it is time for us to part ways. 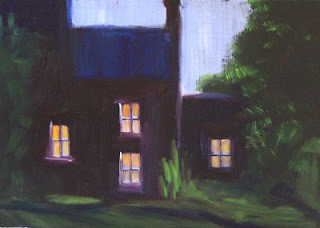 The painting is a petite 5x7 inches and was listed today in my Etsy Gallery. It is available for purchase for $50.00 plus $6.50 for shipping to US addresses. 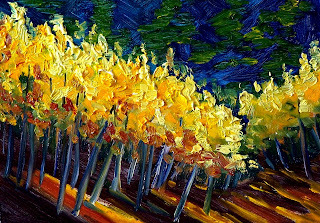 Click here to purchase or view closeups of the texture and brushstorkes, or here to view more water and reflection paintings. The past few days I've been practicing the creation of light and shadow in my painting. 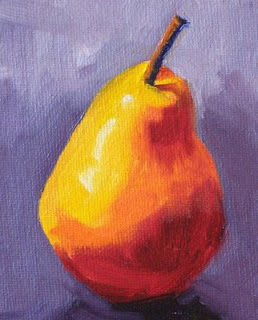 In the case of this yellow pear, I used a palette consisting of Alizarin Crimson, Cadmium Orange, Cadmium Yellow, Ultramarine Blue, and Titanium White. Carefully painting shadows and highlights in exactly the right place is a challenge. This little study is 4x5 inches on a canvas panel. I'm back to work getting some new paintings displayed in my Etsy Gallery. It is the heavy impasto and abstract nature of this one that made me choose it for my first listing of the new year. 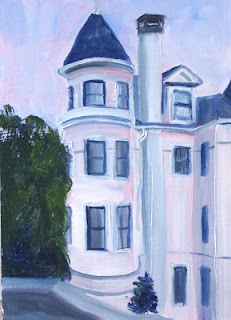 The painting is 5x7 inches on a gessoed mdf hardboard panel. Although it has sold, you can view some of my other small tree paintings by clicking here. I just couldn't resist painting a cat's eyes again. Something about the sparkle and depth draws me to painting these eyes. While I practiced a number of things in my studio today, it's the eyes that I like best. 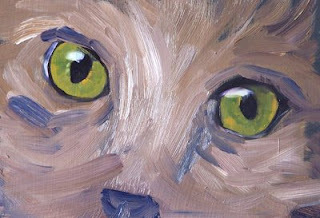 The eyes of this gray kitty were created with a mixture of Sap Green and Yellow Ochre oil paint on a 5x7 inch black gessoed hardboard panel. This morning I woke to snow again. Although it is delightful when the first snow of the year comes around, by the time I've been housebound for a couple of weeks it begins getting old. It is easy to think that bright sunshine and warm weather are just around the corner, but the reality is, with Washington State weather, it is more likely that clouds and rain are next on the agenda. 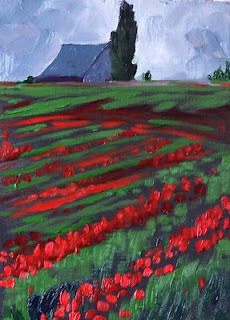 This little 5x7 inch oil painting is typical of spring weather in Western Washington State. We have beautiful fields of flowers and gray, raining skies. It was painted on an mdf hardboard panel prepared with black gesso--a very fitting start for the mood of today's painting. Maintained my Small Impressions blog, posting at least four days a week. 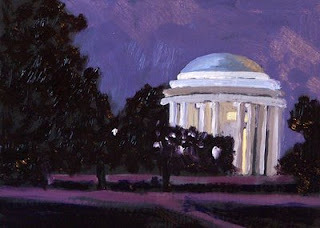 Maintained my Etsy Gallery of small format art with new additions weekly. Opened a Gallery at 1000 Markets for my larger works. Added to my resume with acceptance into several juried art shows. 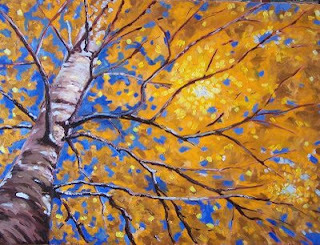 Added some of my tree paintings to the gallery at Northwest Fine Woodworking in Seattle. Over the next few weeks I'll be working on developing my goals for 2009. In the meantime, I hope all my readers had a very happy holiday and will have a wonderful new year.